​The Wicklander-Zulawski's Non-Confrontational Method encouraged the suspect to make a rational rather than an emotional decision to confess, giving the interrogator more opportunities to succeed. In addition, the non-confrontational approach may reveal a pattern of criminal behavior instead of that single incident being investigated. The W-Z Non-Confrontational technique is a highly structured method that allows precise performance measurement and coaching. Supervisors can now confidently guide their officers through clearly defined sections of an interview and interrogation. This 2-day workshop is a complete course in multiple interview and interrogation techniques. 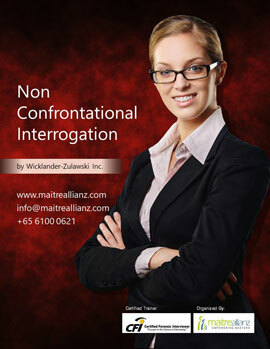 Training is conducted exclusively by Certified Forensic Interviewers (CFI®) from Wicklander-Zulawski. Many interviewers will encounter subjects who refuse to participate, become defiant or aggressive or have been through the system before. The program will focus on techniques to deal with difficult subjects and instruction on how to handle denials and minimize verbal confrontation. 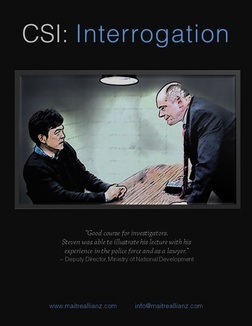 Real case-studies and videos of actual interrogation will be used to enhance learning. The future is now here. This 1-day workshop is Wicklander-Zulawski's advance-level training that combines various interview strategies to develop a structured approach for engaging difficult suspects. Participants will learn methods to get suspects talking, obtained buy-in and ultimately secure commitment for a positive outcome. 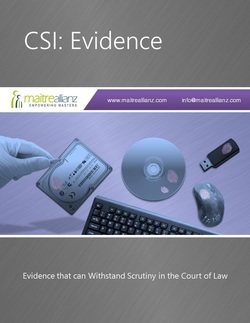 Evidence collection is the first and most crucial part of an investigation process. It is also that which all other investigative processes are built on. It is imperative that all evidence are gathered legally and be admissible in the criminal or civil proceeding as they must withstand the rigorous tests in the court of law. Evidences collected are to support the facts and verify whether an irregularity, fraud, corruption, serious misconduct or crime has occurred. Often, smart defence counsel outwit the prosecution by cleverly casting doubts over evidence produced in court and got their client off the hook, frustrating all the painstaking work the investigating team has done. Even with a confession in court, improperly obtained evidence can derail a seemingly airtight case. 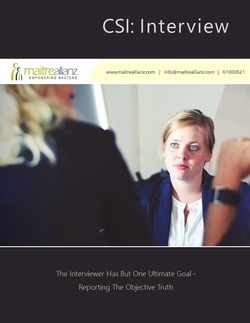 ​Interviews are not about getting a confession but about finding the truth. By just focusing on obtaining admissions, you are not keeping an open mind on the possibility of innocence and that could cloud your judgment in the process. Whatever the reason, it is essential that anyone with investigative duties are trained in investigation techniques, to prevent the loss of evidence, unfair or unethical practices. Proper training will ensure that such matters are dealt with positively by giving all levels of management the confidence that they are able to deal with investigations in a proper manner. ​No ordinary life's experiences or extensive school education is of value when one tries to obtain information from reluctant individuals. 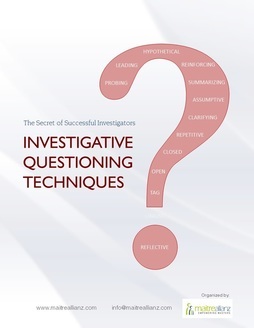 Investigative interviewing techniques is best acquired through structured and systematic training. ​Whether an interrogator can successfully secure a confession or not is dependent on his technique, strategy and experience. While experience cannot be taught, technique and strategy can. Many interrogators learned through trial and error, and by observing their seniors. This is not wrong but it’s a much longer learning process. Interrogation is a special skill that is better acquired through systematic and structured training. And when combined with on-the-job application, it gives you a winning formula. Investigative interview and interrogation are highly specialized skills, and only trainers who are professionally trained in such work and with extensive experiences can give you the best techniques. Some mistakenly think that any expert (e.g. Forensic Accountant, CPA, Snr HR Director, etc...) who is not professionally trained in such techniques , and conducts just a few interrogation work a year is qualified to teach such skills. ​Investigators ask questions to elicit truthful information, fill in information gaps, confirm facts, acquire knowledge, understand the subject, introduce new information and seek evidence. With the elicited information, a suspect can then be asked to confess to his crimes. The ability to use questions to draw out truthful information from subjects, especially reluctant ones, is a key skill for investigators. It reduces investigation time and lead the investigator to the right conclusion. The strategic art of questioning lies in knowing what questions to ask and when to ask them. Basic questions are easy to ask, but many struggle with follow-up questions that involved probing and clarifying the information obtained. 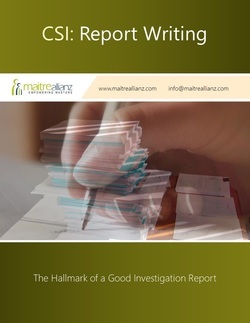 A well-written investigation report not only shows whether allegations investigated are sustained or not, it also supports the conclusion with unbiased account of what happened based on facts and relevant evidence. It discusses the nature of the allegations, explains the applicable standards, and produce relevant facts to guide the reader to the same conclusion the investigators have arrived at. The investigation report is also a crucial piece of document investigators rely on to refresh their memory when they are called upon to testify in court. Inconsistencies between your court testimony and the report is sufficient ground to set aside your evidence. Sloppy writing negates the painstaking work of the investigation team. Inaccuracies or the omission of important information and statements can result in miscarriage of justice or disastrous consequences at trial. The witness box is an unfamiliar, feared and lonely place. Witnesses feel that they are on trial, standing in the dock rather than giving testimony to assist the court. A poor performance can undermine confidence and credibility. Witnesses can also be impeached for changing testimonies. Investigators, professionals and expert witnesses are often inadequately prepared for the rigours of the courtroom. Compounding this problem is the unavailability of such training. Not many investigators have adequate experience to coach their subordinates with confidence, let alone conduct a training for others. 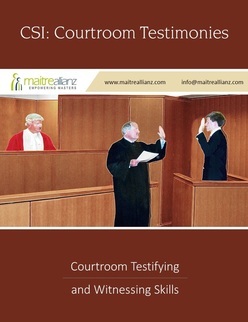 ​Cross-examination by a defence counsel can be intimidating and full of traps. They will pile on the pressure by exploiting your nervousness and trick you into saying something you shouldn't say. In your state of confusion and mind blanks, they will put the best spin on the facts, have you agree to an exaggerated petty issue and put across an apparently absurd idea. Being prepared is the key to survive and excel as a witness. Preparing for a trial requires you to organize, clarify and simplify your thoughts. Trial work is not science but has very important and profound consequences if you do not get your points across clearly and effectively. 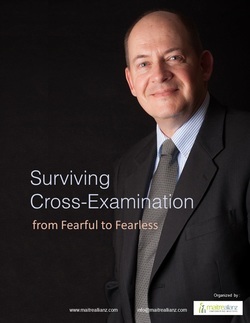 In this experiential workshop, you will know what to expect in cross-examination, preparing for it, recognized strategies of attack and techniques to counter them. A person’s own words often reveal much more than what he or she intended. 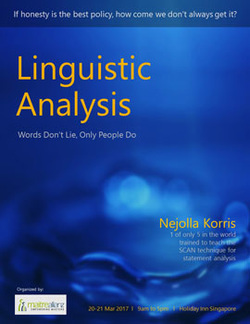 But in order to assess this deeper revelation, an interviewer must be trained in forensic language analysis, such as the Scientific Content Analysis (SCAN) technique. SCAN studies speech patterns, signs of deception by analyzing the structure and contents of statements. The beauty of this technique lies in its ability to quickly direct your focus to important areas in a statement that requires clarification. The analysis is then used to guide their interview strategies, enabling them to ask penetrating follow-up questions, clarify statements made, or probe missing details from an interviewee’s narrative account. This workshop will give you a strong foundation on statement analysis and its application in business and investigative areas. ​The internet is a valuable tool for gathering information and building investigation data. 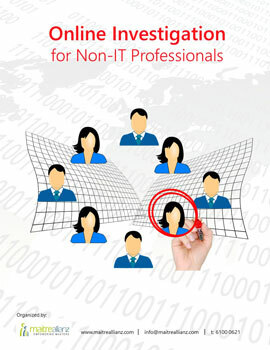 Learn how to use online search tools and databases efficiently and effectively. With the majority of the world’s population on popular social media sites, people share more information online than ever before. Learn how social media and other online communities allow the investigator to gather evidence and other tools to bolster the investigation. This interactive session will have course participants working with various case studies to illustrate how the internet can provide beneficial information to their investigation.